We are developing a swarm intelligence optimization algorithm based on nonlinear dynamical system theory. In this article, we introduce Nonlinear Map Optimization (abbr. NMO) which we proposed. NMO is classified as swarm intelligence (abbr. SI) optimizer and consists of some search individuals whose dynamics is driven by a simple nonlinear map. The simple nonlinear map is regarded as a kind of circle map. For effective optimal solution search, the search point distribution of each search individual is important. The search point distribution is controlled by the simple nonlinear map. The parameters of the simple nonlinear map are controlled so that the search point distribution can be effectively searched for the optimal solution. Also, this map generates a chaotic search point time series while keeping the search range. Such a time series can efficiently search within the search range. As a result, NMO can search along the valley of the evaluation function. Namely, NMO is considered to have a rotation invariance and a scaling invariance. NMO can also be regarded as a system in which one-dimensional map oscillators move while being coupled with each other with a coupling strength according to distance. 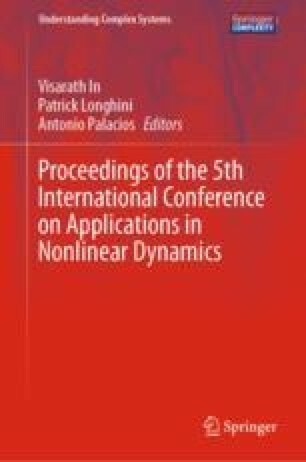 Therefore, the analysis of the dynamics of NMO gives new knowledge of the nonlinear coupled map. This work was supported by JSPS KAKENHI Grant-in-Aid for Challenging Exploratory Research Number: 16K14271, and Grant-in-Aid for Scientific Research(C) Number: 15K06077.